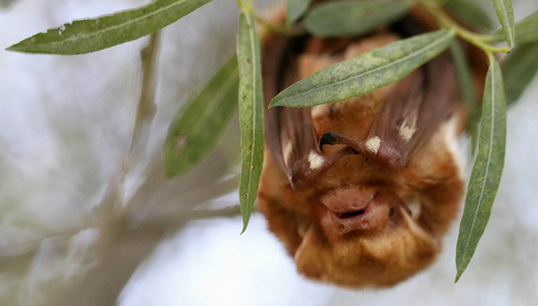 Bats play a critical role in the ecosystem. Learn more about the species that call Michigan home and how you can help conserve these important animals. Below are some resources and activities to try with your students. Michigan bats are all insectivores and have some incredible adaptations that help them survive. Learn all about them at michigan.gov/bats. As a class or in small groups, have students list things they know about Michigan bats. Write down all the ideas and facts on the board, then go through the list and talk about if they are true or false. What myths or misconceptions have you heard about bats that are not yet on the list? Why do you think these myths came about? You also may choose to have the students each pick one of the items listed and research more about it to see if it is true or false, either individually or in small groups. Watch the video Bat Squad! Ep. 1 Amazing Bats and try the accompanying activity on calculating the value of bats. Watch the video Bat Squad! Ep. 2 Hey Bat What's Your Habitat and try the accompanying activity on studying neighborhood bats. Learn more about why bats are important and fascinating on the Bat Week website. Read about the economic importance of bats in agriculture in a Science magazine article. Check out the U.S. Fish and Wildlife Service's Indiana Bats, Kids and Caves – Oh My! Activity Book for Teachers. We suggest trying the activities Pest Control – It All Adds Up and Web of Decay: Cave Food Web Game. Try BatsLive: A Distance Learning Adventure, which brings bats to life through webcasts, webinars and online education resources. Bats are amazing animals that are vital to our health, environment and economy. Yet bats are in decline nearly everywhere they are found. They need our help. During BatWeek 2018, take action! In 2014, white-nose syndrome, a deadly disease affecting North American bats, was confirmed in Michigan. It primarily affects bats during hibernation. Infected bats prematurely awaken from hibernation, rapidly deplete their fat reserves and are unable to survive the winter. 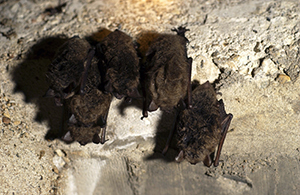 Bats with white-nose syndrome often exhibit unusual behavior, such as flying during daylight hours or gathering outside of caves in cold weather. 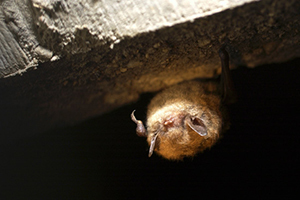 Watch the video Battle for Bats: Surviving White Nose Syndrome (also available in Spanish). Read more on the Michigan Emerging Diseases website or at whitenosesyndrome.org. Watch the video Bat Squad! Ep. 4 Bat Chat! Join The Bat Squad and try the accompanying Bat Squad activity. Have students research or develop a project to help conserve Michigan’s bats. Check out a list of DIY personal activities to help bats on the Bat Week website. Bats, like all wild animals, should be treated with respect and left alone. Wild animals may bite or scratch to defend themselves and could carry diseases or parasites that could be passed to pets and people. Learn more about rabies. Remember, if you find a bat, leave it alone. You should contact your county health department if you come in physical contact with a bat or if the bat was found in a home or other living quarters.